The SDN (Solution Delivery Network)/NFV (Network Function Virtualization) maturity in a service provider environment has been divided into five (5) major levels of maturity. The goal is for each phase to have, qualitatively measured, a significant level of improvement from the previous phase and have surpassed a major hurdle. These phases are called NMM1– 5, that is, Network Maturity Model (NMM) Phase 1, 2, 3, 4 and then 5. Key Outcomes: Federation vertically oriented controllers and orchestrators. 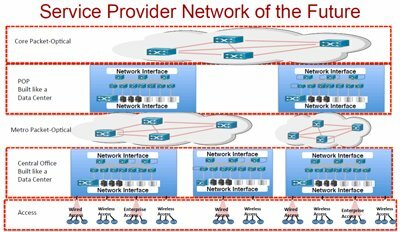 Key Benefits: VNF End-to-end network view that enables network orchestration. The key in this phase is an end-to-end network view which includes the backhaul. Success in this phase allows applications/services to take advantage of the entire network, including tasks such as data centre power optimization and network traffic engineering. The controller-of-controllers and orchestrator-of-orchestrators (i.e., CMP) will have visibility and control of the once-isolated domain controllers. In previous phases (NMM1–3), the domain controllers were isolated. Due to the isolation of domain controllers, an end-to-end network view or complete control of the entire network was not possible. NMM4 is characterized by the orchestration of any domain to other domains in the entire network. Network-wide KPI monitoring and alerts are available, but closed-loop handling is delayed until NMM5.